For roughly four decades, a clear foreign policy rule set has existed between the United States and Latin America, centering largely on the question of counternarcotics. Starting with Richard Nixon's "war on drugs," an explicit quid pro quo came into existence: U.S. foreign aid (both civilian and military) in exchange for aggressive Latin American efforts to curb both the production and trafficking of illegal narcotics (primarily marijuana and cocaine). Bring on that tipping point. Portugal's example is fantastic, a long term yardstick that proponents of decriminalization can point to and say yes this works across the board over the long term. Pour the money from the WOD into education and treatment and cop to the fact that booze kills far more than the rest put together. "Combine California's persistent zeal for individual liberty..."
You get sloppy with your language. You correctly point out that "decriminalization" is not the same thing as "legalization", but then use the two terms interchangeably in parts of your article. I think this is the crux of the problem. America has trouble drawing that distinction. 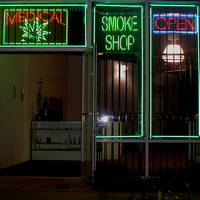 We tend to veer between the extremes of prohibition and libertarian legalization. In part this has to do with our legal/constitutional system that affords largely unfettered rights to any "legal" activity. So, drug dealers get the constitutional right to advertise, hire lobbyists, make campaign contributions, etc., and before you know it, you can kiss regulation good-bye and the government is paying subsidies to marijuana growers and you're seeing heroin on the shelves of your 7-11. I guess I value the civil liberty of breathing clean air. Depends on your perspective. Decriminalization will work as long as Police can still do some type of enforcement activity. Small amounts of weed get you a parking ticket, small fine ($20.00) and your weed gets destroyed. If you are acting like an idiot and smoking weed you get arrested. If in public so wasted you can't stand we arrest you and house you until not high and take you to a judge. Better yet straight to rehab. Start concentrating on punishing or treating the behavior and worry less about a little bit of weed. Cocaine no. Heroin no. Meth no. Or the synthetic analogs or prescription meds. NO. By choice people smoke weed when they can get it. Many would rather smoke weed than consume alcohol. In 20 years of active policing I have yet to fight with someone that is high on cannabis. They sometimes hallucinate but rarely fight. Most don't even drive while stoned...too dangerous. Coke, Meth, LSD, heroin, mushrooms, etc. have all caused fights, chases, overdoses and assorted mayhem and crime. Weed is more potent than it used to be but it is PREDICTABLE.The rest of it needs to be controlled and illegal. Poly drug users...that is another article for Tom to write about and would take to much time and blog space here.